The guiding theme of the exhibition is an exploration of the everydayness – both its environment and mindset. The works making up the “Walk” cast a curious eye on the forever-known and deadly-familiar, looking for cracks in their fabric through which new encounters with places/things/selves might be found. “Walk” results from the residency that Mihklepp and Rubenis carried out in Valga/Valka territory in the summer of 2017. In the course of this residency the Latvian–Estonian border, tying together these towns, was brought into their artistic practice and given a structuring role for the forthcoming exhibition. Working with the border, Mihklepp and Rubenis were interested in bypassing its political and historically dividing roles and unearth in it a function that would allow to see its surrounding environment if not with an entirely new, then at least with a radically refreshed eye. The exhibition works grew out from a performative intervention carried out on the border by the duo on the 14th of august, 2017. The performance involved a six hour walking of the border line that was interspersed with percussive activations/soundings of the border posts. In the course of the intervention the border was approached as a (musical) score. Important elements of the walk are the border posts, which in their natural environment indicate a meeting of different territories, but in the intervention they are translated into musical instruments. The title of the exhibition – “Walk” – was adopted in order to make a connection with “existence of life throughout the times” that has been an ongoing process in the area occupied by the two cities. Valka/Valga’s original Germanic name Walk serves as an anchor in “the other end of history” for this linking. Another meaning contained in the title is a direct reference to the actual walking that constituted the performance – a kind of primordial act of moving through and being with a landscape. 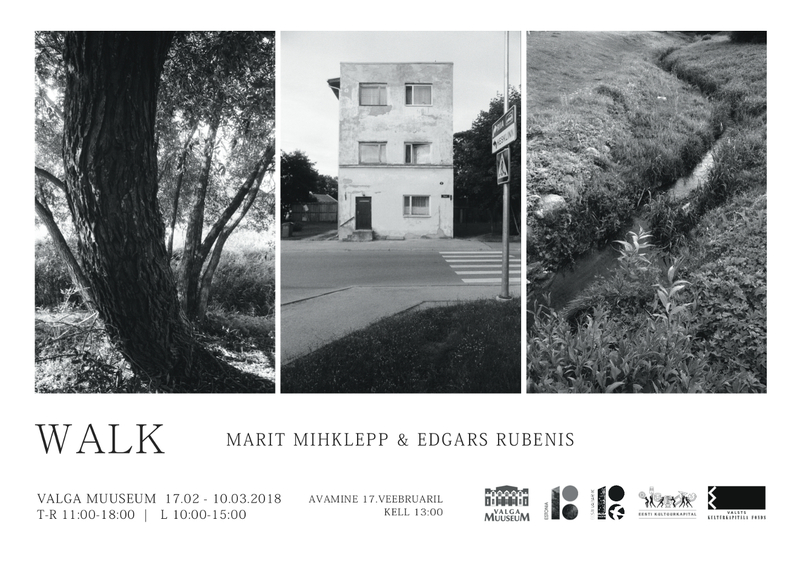 The exhibition “Walk” is part of the project “100 poplars” and is supported by Center for Contemporary Arts Estonia and their Estonia 100 art program “Comers, Goers and Stayers – the histories of Estonian communities”. The exhibition is also supported by Cultural Endowment of Estonia and Culture Capital Foundation of Latvia. Marit Mihklepp is Estonian artist, currently living and working in the Netherlands. She is researching how human everyday processes are related to the other members of the surrounding environment – microorganisms, chairs, stones, country borders. Since the graduation from the ArtScience Interfaculty in The Hague she is working with moving the bodies and imagination of the audience, using simple objects and instructions. Edgars Rubenis is Latvian composer and guitarist. Besides his solo practice and work with the ensemble Mona de Bo he also writes music for films, and theatre/contemporary dance performances. Currently Rubenis lives in the Netherlands where he is pursuing a master’s degree in electronic music and composition in the Institute of Sonology in The Hague. This exhibition is the first collaboration of these artists. As I've put it - this might represent the way of getting rid of a border and making people talk about art. It is about turning the border into an artistic experience and, as the border is the main feature of Valga/Valka that people tend to talk about, many things will change as this main feature and main subject get turned into something else.